You will be met at Salta International Airport and transferred to our joining hotel. 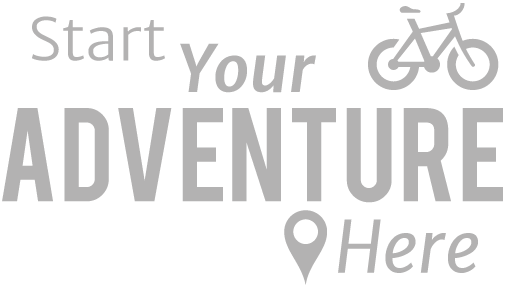 Once you have checked in we will have group introductions, a bike fitting, and a chat about the tour. The city is known as ‘the beautiful Salta’ for its colonial architecture, good weather and scenic natural surroundings, this evening we can enjoy a walking tour of this vibrant city. After breakfast we transfer up to an abandoned railway station. Here we begin cycling along the valley of Las Conchas River. We continue along the stretch known as Quebrada de las Conchas (Gorge of Shells), an ancient ocean floor, cycling along route through stunning sandstone and rock formations in a rich palette ranging from vibrant to muted reds that contrast with the greens of the valley floor. Argentinians have named the various formations to reflect their shapes: La Garganta del Diablo / Devil's Throat, El Anfiteatro/The Amphitheatre, La Yesera, etc) There area is rich in birdlife; you might spot a nandu (rhea).The late afternoon sunlight throws an array of colour across the landscape as we reach our destination near the colonial town Cafayate, an idyllic location surrounded by vineyards. This morning we begin cycling southwards to the Sacred City of The Quilmes; an imposing archaeological site. The city was home to as many as 5000 indigenous Diaguitan people prior to the Incan and Spanish populations (dating back to the 9th Century). They survived the arrival of the Incas but the remaining 2000 inhabitants were deported by the Spanish in 1667. The site is an extensive network of roofless but restored low walled rooms comprising a terraced pukara. A walk up the hilside will give you insight into the elaborate and expansive layout of the area. There is a museum on the site exhibiting ancient ceramics, tools and modern crafts. After a guided tour and lunch you can either cycle back or transfer by vehicle. Today we cycle a tough route mostly on unsealed mountain roads that continually rise and fall; our efforts will be rewarded with stunning views. As we leave wine country behind us our surroundings change becoming more arid. You will see cacti growing alongside the road. We visit the picturesque village of Molinos, a place that seems lost in time. 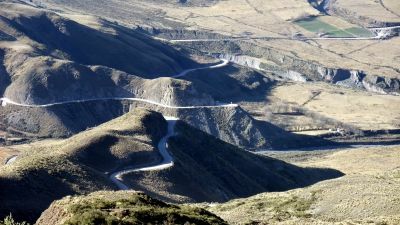 From here the road conditions improve taking us to Cachi a remote colonial town with white houses and cobbled streets. Weaving is a tradtional craft here and you might well be tempted to to buy yourself a poncho or shawl. We stay tonight in a traditional northern lodge. We depart from Cachi, cycling north for 10km passing through Payogasta village; from here we turn south and cycle a gentle climb following the Recta de Tintin a 11km stretch of perfectly straight road that was once an Inca trail. This takes us into Los Cardones National Park. We climb though the hills onto a barren plain continuing to the Piedra de Molino pass. From here we have a cycle downhill zig zagging along the Cuesta del Obispo (Bishop Hill); a twisitng road through sculpted rocks. We will hopefully see one or more wild condors and are guaranteed to enjoy the vistas of the Enchanted Valley beneath us. Our ride for the day ends here and we transfer by vehicle to Salta. 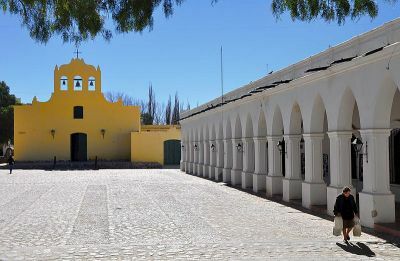 There is plenty to enjoy in Salta, from colonial architecture to beautiful natural landscapes. Moving in a clockwise direction around the 9th July Square you will find neo-classical Catedral Basilica de Salta, the Museum of Contemporary Art, the Cabildo ( former city town hall, now a museum) and the neoclassical Museum of High Mountain Archaeology, which houses Inca artefacts including 500 year old Incan Ice children. Within walking distance of the Square is Saint Francis Church and the city's three pedestrian streets: Alberdi, Florida and Caseros. The three blocks in Baclare Street to the train station are now the centre of night life in Salta, with restaurants, pubs and cafés on both sidewalks and concerts every night. You can take a cable car or climb over 1000 steps up San Bernardo Hill for spectacular views of the city and the entire valley. You could spend the evening at a traditional Pena (folk concert). Regional music features guitars, sheepskin drums, violins, and of course local gauchos (cowboys) you can even participate, clapping along to the criolla music, a mix of Spanish and indigenous styles and a part of daily life here. After an early breakfast we have a short vehicle transfer (18 km) up to the small village La Caldera. This is the starting point of El Camino de la Cornisa (the Edge Route), heading north we cycle through rainforest along a paved single track road less than 4m wide with some sharp bends and dramatic views. After enjoying a picnic lunch we transfer by vehicle to Tilcara, our stopping point for the night, surrounded by picturesque hills. The village is named after the Tilcara people. Nearby overlooking the Rio Grande, are restored ruins of a pre-Incan fortification and a high altitude botanical garden. There is also an archeological museum in the town. Today we cycle through the Tilcara area and then on to Purmamarca, along the shores of Río Grande. The town’s white chuch dates from the 17th C and inside there are paintings from the Cuzco School. There is a lively daily market selling local handicrafts. After another early breakfast we transfer to the famous Salinas Grandes (The Big Salt Plain) a 12 hectare dried out saltwater lake on the Puna. We cycle through an seemingly infinite sea of salt framed by a strikingly contrasting blue sky. We will have a picnic lunch at the heart of the salt flat, then transfer by vehicle for a while before a dramatic downhill cycle down the Lipan Steep which drops from 4200m to 2200m over 30km to reach Purmamarca. Day 11: Purmamarca to San Salvador de Jujuy via Seven Colours Hill. We begin cycling from our hotel to Cerro Siete Colores (Seven Colours Hill) an extraordinary mountain of contrasting coloured hues caused by many years of geological activity and erosion. Legend tells that in ancient times the local village children crept out of their beds at night to paint the mountian. It is also referred to as Hill of the Seven Skirts, reflecting the striped colours design on tradition Andean women’s apparel. We turn to cycle downhill towards San Salvador de Jujuy following winding road. We pass through the villages of Tumbaya and Volcan, leaving the rocky desert surroundings behind as we reach the colonial town San Salvador de Jujuy. 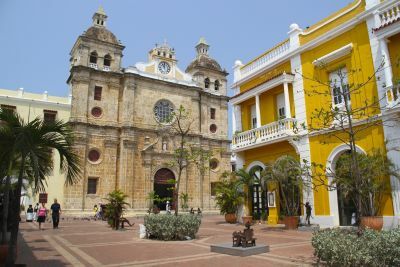 There is a lovely cathedral here and a traditional market where you can buy food and textiles. A free morning with time for shopping or sightseeing in San Salvador de Jujuy before you transfer to the airport for your journey back home. Note: distances in kilometers for cycling are approximate and are not mandatory as there will be a support vehicle with you at all times.